Yesterday was full of ecstatic, relentless, and unbridled rage for activists, and mounting fear and frustration for executives and employees at The Kolter Group, a real estate and development firm based in Palm Beach County. Over a dozen people with Everglades Earth First!, joined by members of Smash HLS and activists with the No New Animal Lab campaign (which was passing through South Florida on its cross-country speaking and protest tour), swarmed the sidewalks in front of Kolter’s offices in downtown West Palm Beach for an energetic noise demo during the afternoon’s torrential downpour. To keep the pressure constant and immediate, activists then headed to the homes of two Kolter executives: Bobby Julien, CEO; and Howard Erbstein, COO (Chief Operating Officer). 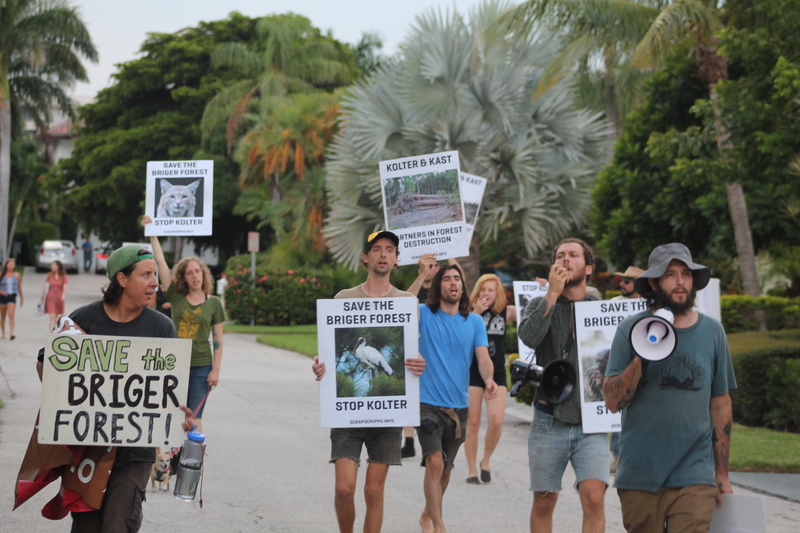 The protests were in response to Kolter’s plans to develop part of the Briger forest into Alton Homes, an upscale housing development that would neighbor animal testing facilities, strip malls, and hotels. The Briger forest is one of the largest unprotected tracts of forest along the eastern corridor of I-95 in Palm Beach County, and is home to at least thirteen federally and/or state-listed endangered and threatened species. EEF! and PBCEC have been tirelessly fighting the destruction of the Briger forest for almost a decade, focusing on Kolter Homes for seven months—two months after KAST Construction, the company contracted to clearcut the forest, was discovered illegally cutting in the area. Kolter has lied about the number of endangered and threatened species found in the forest and where endangered species have been relocated. The noise demo outside Kolter’s downtown offices was one of the most lively and effective the campaign has seen in weeks. In spite of (or perhaps because of) heavy rains, thunder, and lightning, activists flooded the sidewalks with their bodies and the air with the screams of their unrelenting condemnation, chanting “Your money! Your fault!” and “Shut them down!”, a new voice continually picking up where another left off to create an unbroken cacophany of shame. About halfway through the protest, someone passing by the offices saw the anti-Kolter signs and decided to join in the chanting. He said he was sick of developers destroying Florida’s forests, and wanted to do something about it. Bolstered by the group’s high energy and enthusiasm, activists kept up the noise for an hour until several Kolter employees couldn’t take it anymore, and left their offices early with police escorts. 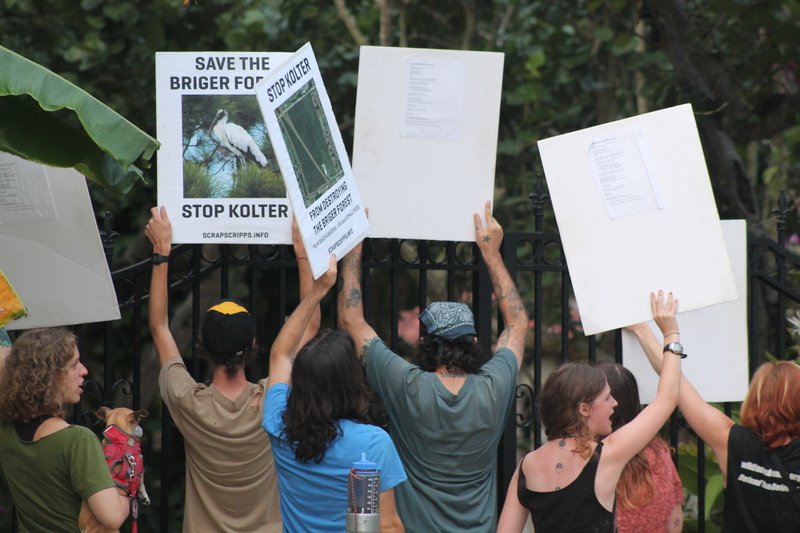 Activists made their way to the beachfront mansion of Bobby Julien, CEO of The Kolter Group, where a high iron gate bars entry to a sprawling driveway, at the end of which a courtyard with pillars and wide, sweeping steps gives onlookers an idea of the luxury that violent eco-destruction affords affluent developers. Activists stood at the gate with signs and yelled chants that called out Bobby’s role in the destruction of the Briger and the deaths of the animals who have nowhere left to go—unlike Bobby, who thinks he can hide from his shameful actions in the opulence of his blood money. Some passing cars honked to show their support, some just slowed down to gawk at the spectacle, and some pulled over to get more information about the campaign to save the Briger. The next stop was the home of Howard Erbstein, COO of Kolter. Drenched from the rain, voices hoarse, but still amped and running on rage nonetheless, activists announced to the neighborhood that Howard plays a key role in the bulldozing of the Briger and the murder of the animals who live there, like the gopher tortoise, the snowy egret, and the bobcat. They chanted, ranted, screamed, and condemned. They addressed Howard by name, decrying his part in the senseless annihilation of wild places and urging him to use his power to cancel Alton Homes and leave the forest alone. The day’s protests sent a clear message to Kolter and its executives: We know what you are doing. We know where you work. We know where you live. You can hide behind the cops, and you can escape to your disgusting luxury lairs, but you can’t wash the blood off your hands. We will never back down. Until you stop the killing.